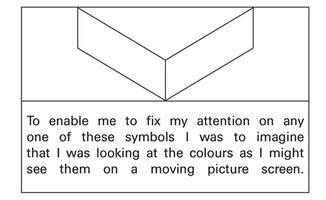 To enable me to fix my attention on any one of these symbols I was to imagine that I was looking at the colours as I might see them on a moving picture screen. 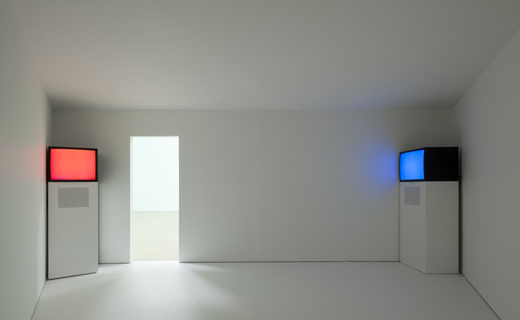 What prompts someone to go to see an exhibition by an artist who’s unknown to them? Is it the reputation of the curator or the organisation(s) promoting / hosting the exhibition? Is it visual intrigue, perhaps an image, or a poster? Is it a layered decision… appetite whetted as one reads on, and then makes a decision? I guess it probably depends on the individual, and the power of the ‘prompting’ stimulus/stimuli. I hadn’t heard of Hannah Rickards before, but I was intrigued as I’d met Paul Hobson who’d told me that this insertion into the programme was his doing, and he’d worked with her before. I was surprised by the relatively ‘last minute’ nature of this show by curatorial standards (knowing that so many exhibitions can be about three years in the making). So who is this Hannah Rickards, and why has Hobson so confidently nailed her colours to the Modern Art Oxford mast? However, when I read on the Modern Art Oxford website that Hannah Rickards is drawn to natural phenomena such as birdsong, thunder, mirage and the aurora borealis, which she examines through spatial works that take the form of moving image and sound I realised that there had to be more to this show than two dimensions, more than monochrome lines and text – there had to be colour, sound, movement, physicality of some description, there had to be leaps of imagination… I was intrigued, I was there, and I left sold. Bringing together Rickards’ important works to date in an interwoven configuration that spans all of the first floor galleries the exhibition is like taking a walk in the countryside in that it’s a personal exploration, the route isn’t dictated, but there are paths and physical markers to negotiate, and what you see and hear will entirely depend on what you’re open to seeing and hearing. I didn’t find all of the work captivating, but I did find most of the work captivating, and the transporative experience of visiting the exhibition was, in itself, a truly fabulous one – meditative, reflective, a journey of heightened, transitory sensory experiences. If I could have thrown my arms around this show and licked it, I would have done… but it’s just too big; conceptually bursting out beyond the walls, floor and ceiling of the gallery spaces – it’s enormous, a truly immersive experience! The light changes as one climbs up into the first floor galleries. 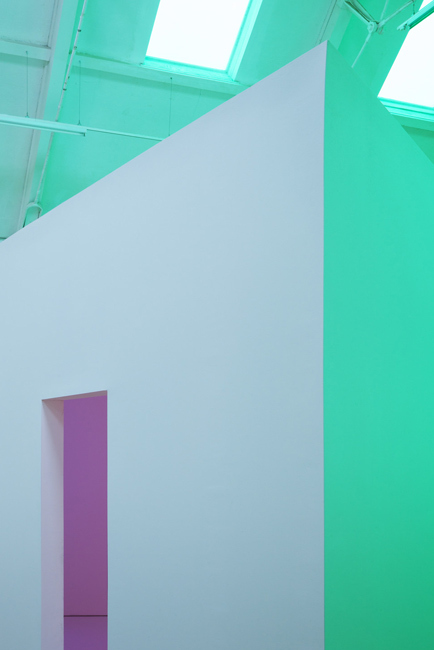 Rickards has installed coloured gels in the space adding a heightened sense of dynamism to the light and visitor experience. I found myself questioning, doubting my own perceptions as my pace slowed, and I found myself moving cautiously around a room that was behaving in a way that I had never noticed before, yet it didn’t appear to have fallen pray to significant interventions, not to the scale by which I was being moved, anyway. Like land art, but inside. Her new work, Right here and then nothing anywhere else. (2014), is a great example of this. Merely a descriptive tick chart. It reminded me of my English Literature teacher at school, Dr Foster. I recalled him discussing imagination and compartmentalisation with us. The way in which adults feel more comfortable (and therefore strive to) pigeon hole, whereas children haven’t developed a system to do this, and as it doesn’t really seem natural, as very few things in life fit neatly in their place, it seems like a ludicrous exercise, yet it’s one that we increasingly find ourselves being asked to conform to through life. Putting their subjects into sharp focus, each of Rickards’ works breaks down the auditory, visual, or spatial relationships of its subject into minute parts for individual examination. And this amused me, in a giddy way (giddy in the case of Thunder, a musical transcription and performance), the experience becomes so heightened, so intense that it’s thrilling; then one returns to the act of pigeon holing – how can one pigeon hole a sensory experience… or something!? Visitors will encounter a piece of work with an incredibly long title, The sound I think it makes is, is that whispering sound, to me it sounds, it sounds almost, um, uh, what’s the word I’m thinking? Um, like historic, not historic, but, um, oh: a legend, it sounds like a legend, you know, when you think of a legend or something way back in the past you get that, that, it sounds like that to me, like this legend or somebody’s, this whispering sound: it’s a legend. The work is as much a three-dimensional object, a sculptural intervention and a light prism as it is a three-channel audio and video installation. As alluded to in the title, it can be virtually impossible to eloquently describe an experience sufficiently… it comes easier to poets, yet is the exact opposite to what lawyers do in a world where there is no room for nuance. Yet, sometimes nuance is everything, you’ve just got to open yourself up to the intangible possibilities of it, and free yourself to wallow in it. This is an exhibition that deserves time, repeat visits in different weather conditions, repeats visits when you’re in a rush, and when you have all the time in the world. And isn’t that the wonderful thing about publicly funded exhibitions in the UK – the efforts of a team of radical gallery staff enable us to make these repeat visits FOR FREE! … and as Modern Art Oxford approaches its 50th anniversary on Pembroke Street, we are reminded that this is exactly what the gallery has been doing for half a century. Step back in time to 1969 when conceptual artist Roelof Louw created his seminal installation Location, a continuous black rubber band stretching horizontally around the four walls of the Upper Gallery at Modern Art Oxford. The exhibition opened to mixed reviews in ’69. 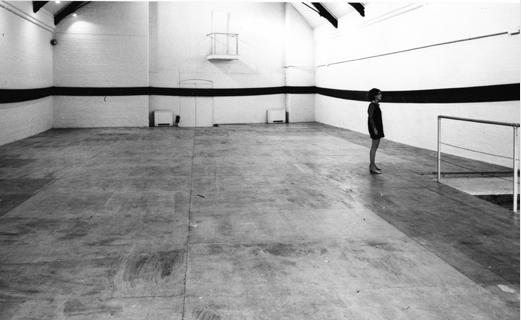 Whilst conceptual art, performance art, and work of this interactive nature was becoming increasingly common-place in major cities in the Western world, it was quite a radical move for a regional art gallery, and apparently not everyone in Oxford was ready for it – hopefully this isn’t still the case! 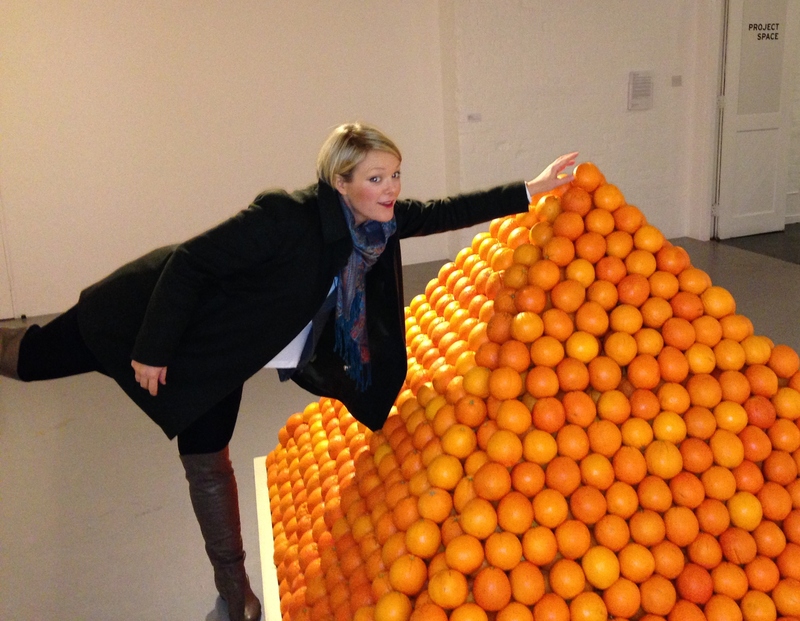 Yet Louw’s critically acclaimed early work became renowned for its complex relationship between physical space, sculpture and viewer, as seen in Pyramid (Soul City), a carefully constructed pyramid of 6,000 oranges which gradually disappears as visitors help themselves to fruit (go on, take one of your five a day!) re-installed (with fresh oranges) in MAO’s Project Space. This Roelof Louw archival exhibition was unearthed by PhD student, Hilary Floe, upon the revelation that Hannah Rickards’ work was going to be on show, and the two bodies of work chime perfectly. The Roelof Louw work forms part of a review of the history of exhibitions at Modern Art Oxford that will lead up to the 2016 anniversary. I went to see this exhibition on a cold, grey day feeling a bit miserable, and sorry for myself – I left elated, with a spring in my step, loving life, nature, art, and the fact that this gift is free. This entry was posted in Worth a Look and tagged art, colour, conceptual, Hannah Rickards, Hilary Flowe, installation, light, Modern Art Oxford, nature, oranges, Paul Hobson, perception, Roelof Louw, sensory, smell, sound. Bookmark the permalink.